Manu Platt, associate professor in the Wallace H. Coulter Department of Biomedical Engineering at Georgia Tech and Emory, was selected to receive the 2017 Biomedical Engineering Society (BMES) Diversity Award. As the annual honoree, Platt was selected for his outstanding contributions to improving gender and racial diversity in his field. As part of the award, he will have the opportunity to give a lecture offering his vision of the challenges and opportunities of greater diversity in biomedical engineering at the BMES Annual Meeting in Phoenix. His lecture will also be published in The Annals of Biomedical Engineering. 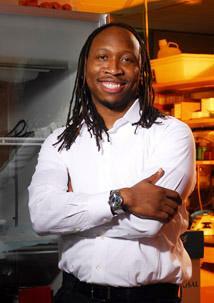 Platt is the Diversity Director for the NSF Center on Emergent Behaviors of Integrated Cellular Systems, and he is a co-founder and co-director of Project ENGAGES, a biotechnology and engineering research program for African-American high school students in Georgia Tech laboratories. He was also featured in the Diverse: Issues in Higher Education magazine in 2015 as an Emerging Scholar. Platt’s research focuses on understanding how cells sense, respond, and remodel their immediate environments for repair and regeneration in health and disease, and translating this knowledge into addressing global health disparities. BMES is an international society that aims to build the biomedical engineering community and support the professionals who develop and use engineering and technology to advance human health and well-being. View highlights of Manu Platt's presentation at BMES in Phoenix, Oct 2017. Full video of Manu Platt's presentation.